Many San Diegans feel rising housing and rent prices are slowly pushing them out of an area they love. SAN DIEGO (KGTV) - The first thing Whitney Dickerson does when she gets home from work each evening is make a cup of her favorite tea. It's because her job as a veterinary technician can be stressful. "Everyday I go in and I don't know what's going to go through those doors," she said. "It could be a really emaciated animal with severe mange, it could be a really happy lab coming through." But Dickerson's angst doesn't end when her shift is over. She's living paycheck to paycheck, and has moved seven times in her six years in San Diego just to find a rent she can afford. She's now splitting a two-bedroom apartment in Talmadge, which goes for $1,874 a month. She's not sure how much more she'll be able to afford. "I feel like the city's slowly pushing me out," she said. 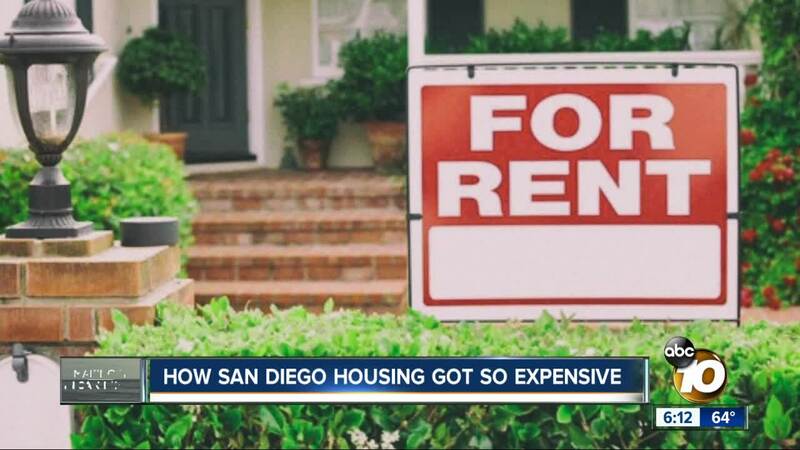 Now, the rent's getting so high that it's near a tipping point for thousands of San Diegans. 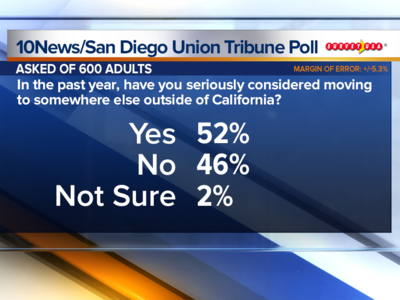 More than half of those who responded to a recent 10News Union-Tribune scientific poll said they'd seriously considered leaving California in the last year. The average rent is now $1,887 a month, up 8 percent from a year earlier, according to Marketpointe Realty Advisors. And CoreLogic reports the median home price in the county is now about $550,000. "That's a problem for everybody, and I think everybody feels that," said Rick Gentry, who heads the San Diego Housing Commission , which oversees affordable housing in the city. </p><p><strong>HOW DID WE GET HERE? 1) There's not enough housing for the middle class. 2) There aren't enough resources for low-income individuals. 3) The current market has already swallowed up the glut of homes built during the housing bubble before the market crashed in 2008. "And that means the marketplace has gotten that much more expensive and that much tighter," Gentry said. "There's no place to move to." 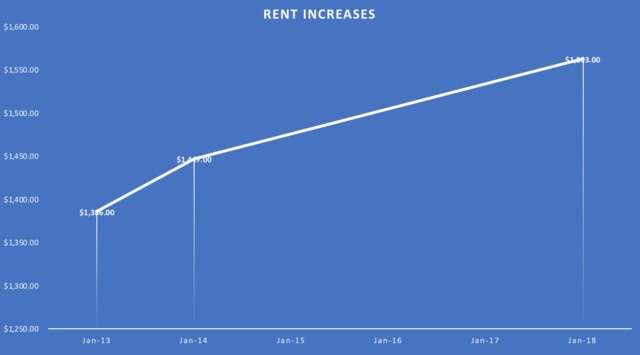 Gentry added turnover has declined drastically at the 3,400 affordable apartments the commission manages, and the section 8 voucher waiting list has ballooned to 80,000. Plus, San Diego County continues to grow with more jobs - employers added 27,000 new payroll positions in the last 12 months. Meanwhile, developers in the county only pulled permits for 10,000 new homes. "It takes a long, long time to get approvals for buildings to put new product online," said Mark Goldman, a real estate lecturer at San Diego State University. "There are more and more impact fees that makes it more expensive, there's a limited amount of land to do it." Goldman said it's a very complicated, risky business to start with a piece of vacant land and try to put a lot of housing on it. He said the amount of time that it takes given environmental review, regulations, and delays raises the cost of projects - to the point that some developers just drop it. WHAT WILL SOLVE THE CRISIS? There is movement in the works to spur development, including a region-wide plan to encourage development along transit routes. The city of San Diego also recently approved streamlining complexes with microunits and fewer parking requirements in these areas. The state also has a new law that allows the Housing Commission to make loans for the development of multifamily complexes that are affordable to middle income earners. 10News will dive deeper into solutions for Making it in San Diego on Friday. But until the prices come down, renters like Dickerson will be bracing for when their leases end. "If they go another $200-$300 like a lot of places are doing," she said, "I'm probably going to have to move again." How are you dealing with the housing crunch? Email us at tips@10news.com.